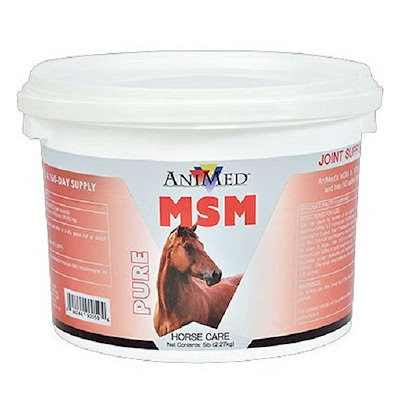 MSM (Ani-Med) contains 100.00 per cent pure MSM, of dietary Methylsulfonylmethane per pound to provide a bioavailable source of sulfur. Feed 1 rounded measure twice daily for the initial 7 days, then reduce to 1 rounded measure daily for maintenance. MSM powder one full scoop (10 grams) per day (one level teaspoon of MSM equals 5 grams)(one tablespoon = 10 grams). For maximum results build up to at least 20 grams (two full scoops) of MSM a day. MSM supplements have a somewhat bitter taste so dissolve in warm water and follow with another drink like orange juice. Research studies have shown that MSM (sulfur) declines with age, so you would want to boost your MSM dietary supplementation as you age.